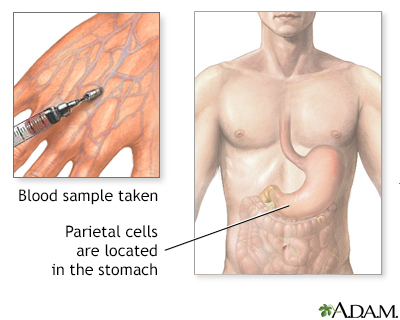 An antiparietal cell antibody test is a blood test that looks for antibodies against the parietal cells of the stomach. The parietal cells make and release a substance that the body needs to absorb vitamin B12. Your health care provider may use this test to help diagnose pernicious anemia. Pernicious anemia is a decrease in red blood cells that occurs when your intestines cannot properly absorb vitamin B12. Other tests are also used to help with the diagnosis. A normal result is called a negative result. Cooling L, Downs T. Immunohematology. In: McPherson RA, Pincus MR, eds. Henry's Clinical Diagnosis and Management by Laboratory Methods. 23rd ed. St Louis, MO: Elsevier; 2017:chap 35. Hogenauer C, Hammer HF. Maldigestion and malabsorption. In: Feldman M, Friedman LS, Brandt LJ, eds. Sleisenger and Fordtran's Gastrointestinal and Liver Disease. 10th ed. Philadelphia, PA: Elsevier Saunders; 2016:chap 104. Antiparietal cell antibodies is a test that measures the presence of antibodies against gastric parietal cells. Ninety percent of people with pernicious anemia test positive for antiparietal cell antibodies.